Well, it’s been an interesting couple of weeks here. A few highs and lows which are a natural part of life. Since surfing these emotional waves is not my forte, I planned to climb a mountain for some nature therapy. I was hoping to regale you with sweaty tales of danger and delight as I scaled the summit of Mt Maroon, a class 5 walk requiring high fitness, navigational skills, and some rock scrambling with a 360 degree view as a reward. However, my dreams were short-lived as the heavens erupted the night before and I woke up to a warm, humid day with even more showers and storms predicted. Storms and rock scrambling do not mix. The weather probably saved my daughter from having to write an obituary post anyway. Disappointed but not defeated, I rang my son and asked him if he’d like a walk in Toohey Forest Park on the weekend. I woke before my alarm went off as I do every time I’m going to a new hiking destination. While dunking my sugar and fat filled gingernut biscuits into a mug of organic, ethically grown healthy green tea (they balance each other out) I was anticipating being able to write a riveting blog post about venomous snake encounters and fluffy koalas. A twinge in the abdomen as I left the house was ignored. By the time I’d arrived at my son’s house the twinge had become an alien trying to burst out of my belly and not just a normal alien – a spiky, electrified, elephant-sized one. (Ok, I admit I have been re-reading some Roald Dahl childhood favourites lately.) I hadn’t walked a metre in Toohey Forest and yet I was already drenched in sweat and in more pain than I’ve ever been on a walk. Toohey Forest will remain unexplored for the moment. I’m not sure what morsel of food was contaminated but I refuse to believe it was the gingernuts. So this week I’m offering you a regular walk I do a few times a week, for most of the year. Some days I work at the University of Queensland and in breaks I walk or jog along the paths that follow the delightfully murky brown Brisbane River. It’s a popular spot for students and locals to get some exercise. I usually do 8-10 km depending on the time I have. Here’s a typical example of the lovely wide, tree lined paths I take. I admire female golden orbweaver spiders along the way. In this picture you can see the tiny male. Unlike the previous post, I was more careful not to disturb the couple so Casanova lived to woo another day. It makes me strangely happy that the females of the arachnid world can be much larger and scarier. Apparently the glistening golden silk web is attractive to bees. 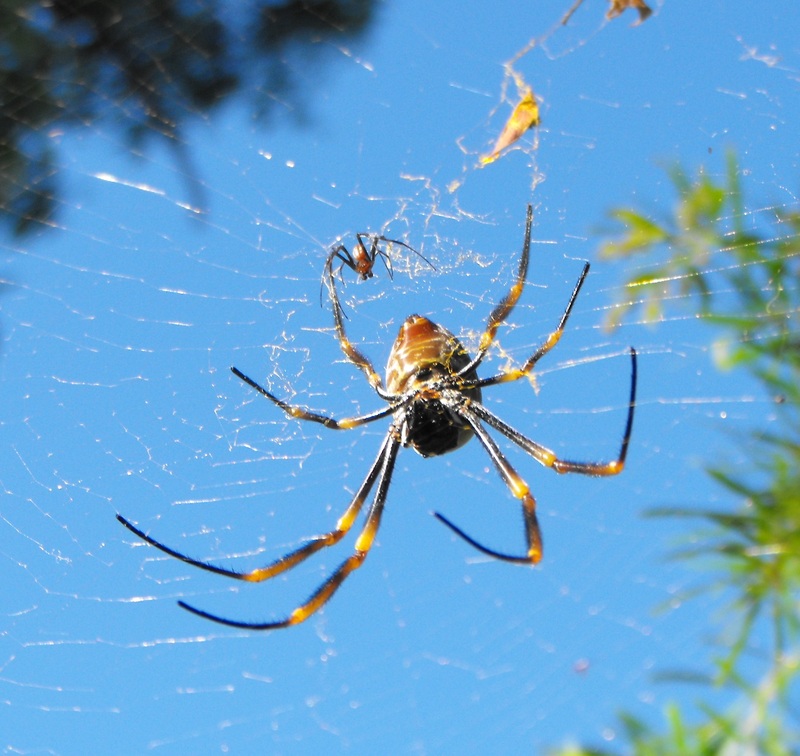 Here in Queensland they grow very large and the webs have been known to catch small birds. 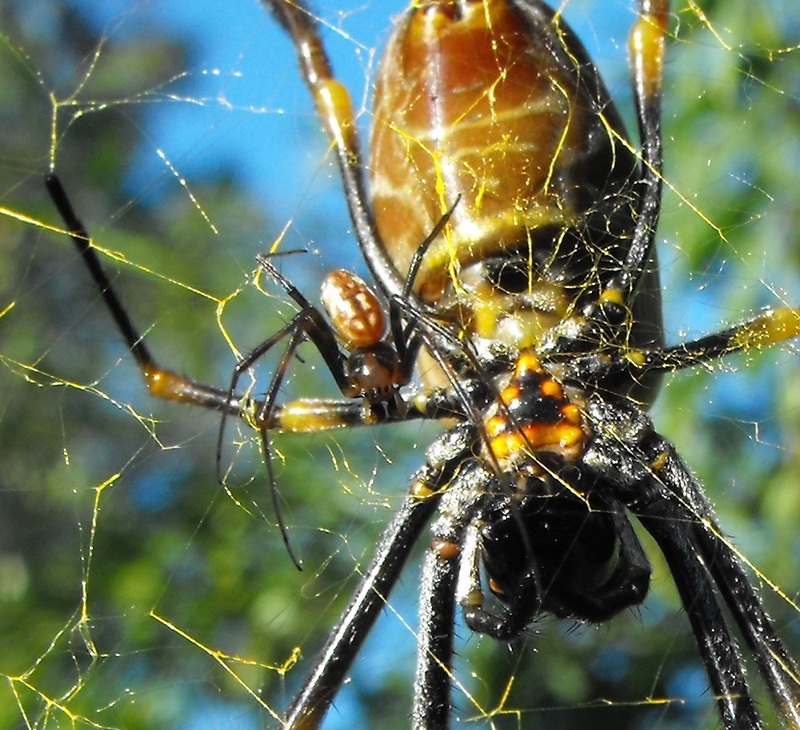 Here is a link to a video of one such spider biting a snake in its web. 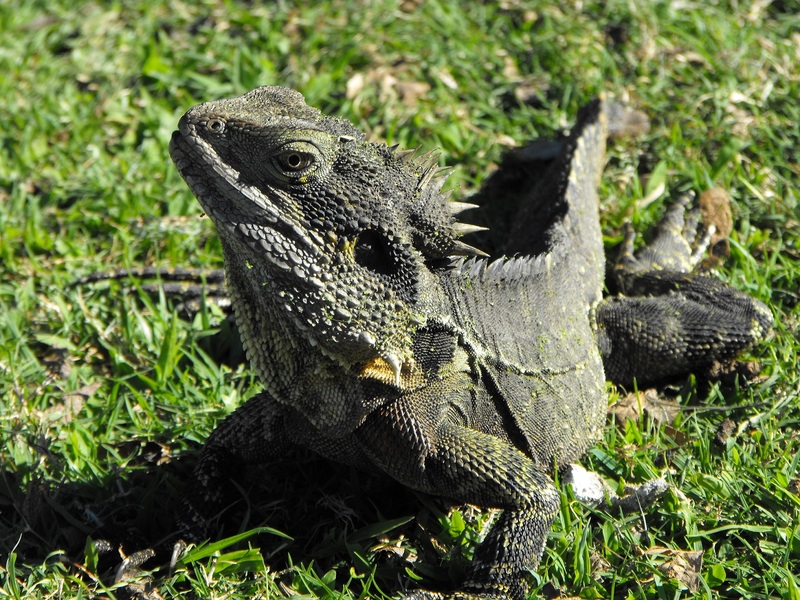 Water dragons are a common sight and this one gave me the usual stare down. 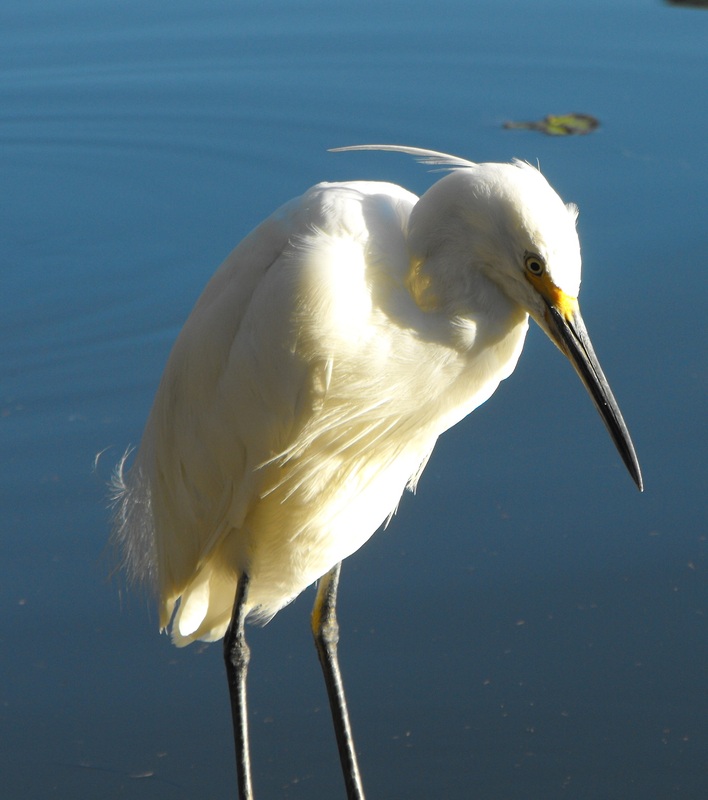 The university lakes and sports grounds are home to a wide variety of birds. 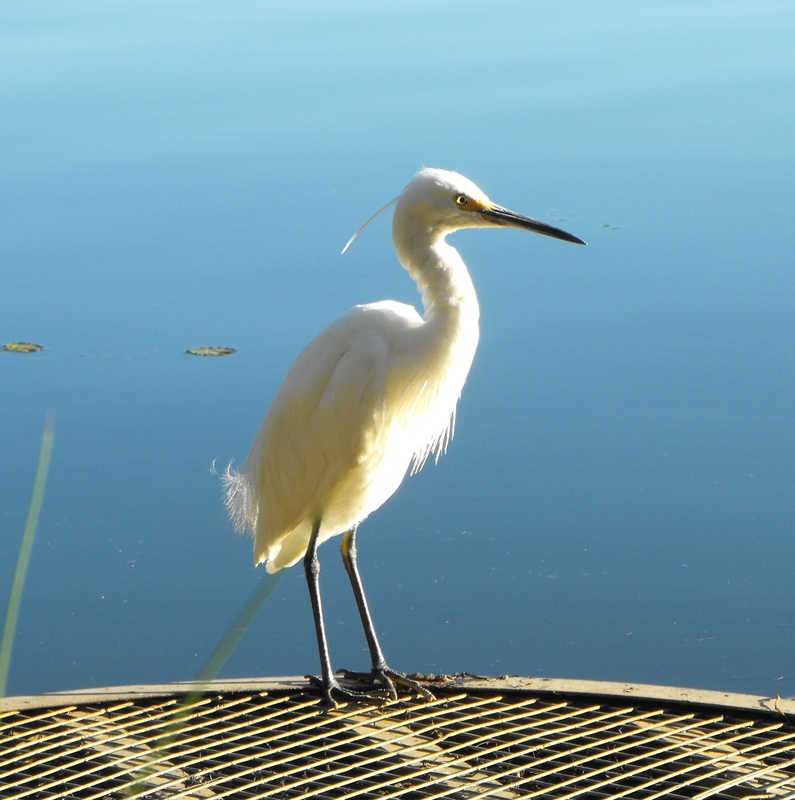 Recently I was startled to see this beautiful egret standing on a grate right by the path. I’ve never been so close to them before. 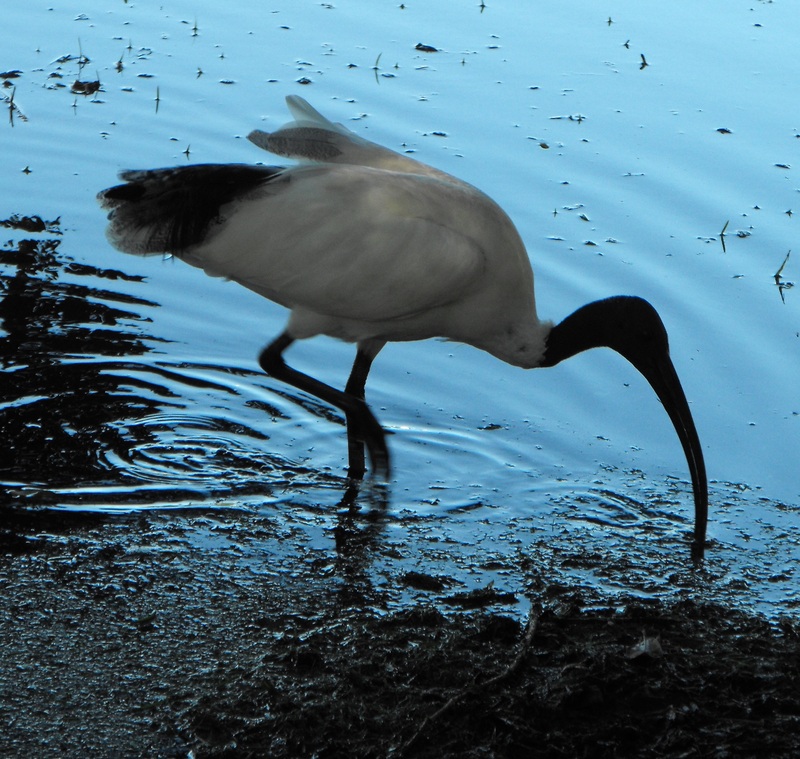 This week Paula Peeters wrote a blog post about why ibis are grubby and egrets are so clean which is very convenient for this blog post. Check out her post if you are interested. Paula explains it much better than me. 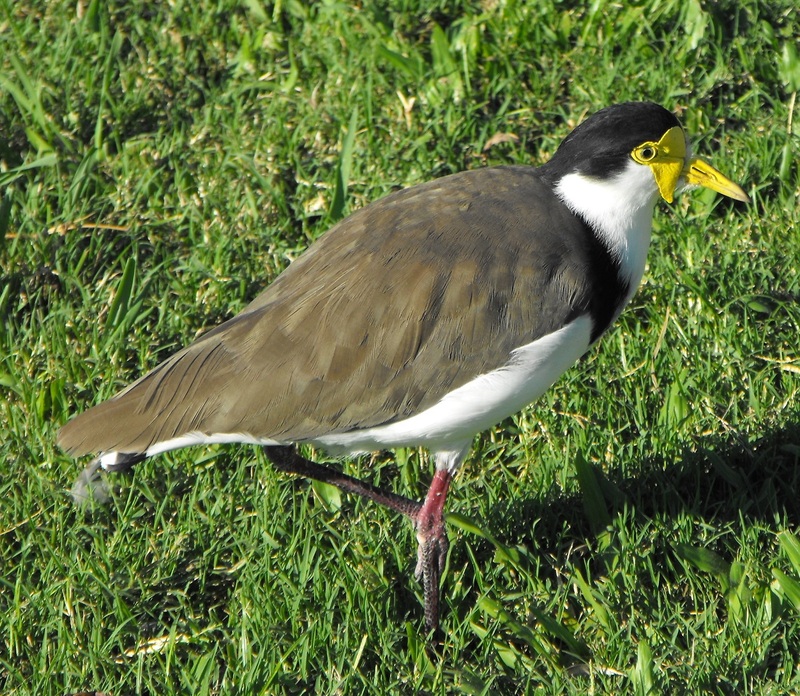 I usually don’t get this close to masked lapwings either. I have a pair in my suburban street that nest by the side of the road. I often see a chick standing perilously close to passing cars. I also see wood ducks, Pacific black ducks and purple swamphens. And then there are the human creatures I often see riding on two wheels. What a joy it is to see so many bicycles. They are not common in my suburb. 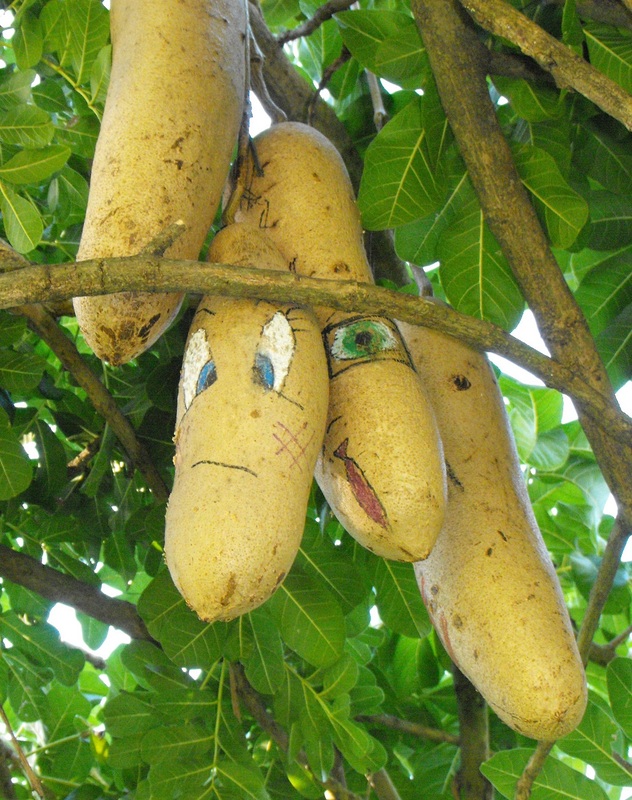 Back in 1987 when I started my studies at the university, I saw this unusual sausage tree, Kigelia Africana, which is native to parts of Africa. As you can imagine, they provided a source of amusement to some students. The fruit is actually a woody berry and can weigh from 5 – 10kg. Like the bunya nuts from another post, it is recommended you walk under them with caution. They are a source of food for a variety of African mammals but apparently the raw fresh fruit is poisonous to humans. Here in Australia, cockatoos have been known to eat them. 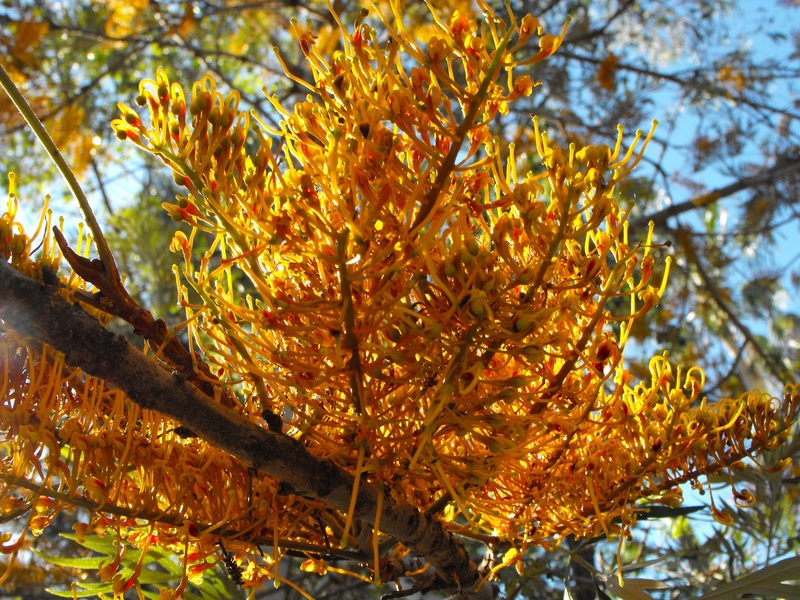 Grevillea robusta, commonly known as the Australian silky oak also grows along the river paths. The golden blooms are very attractive to wildlife. 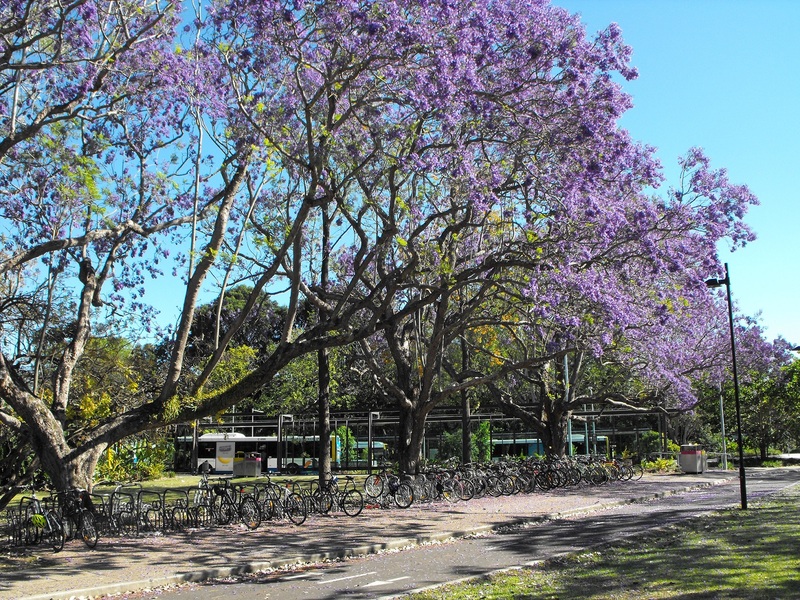 And another tree which is quite well known at the university is the Jacaranda, a genus from the Bignoniaceae family, native to South America. They usually flower close to study week (swot vacation) leading up to final exams of the year, so the purple explosion is not an event many students welcome. There are a few superstitions about the petals. The one that I remember from my uni days was that if a petal fell on your shoulder you would fail your exam. I am heartened by some of the improvements to public transport for students. 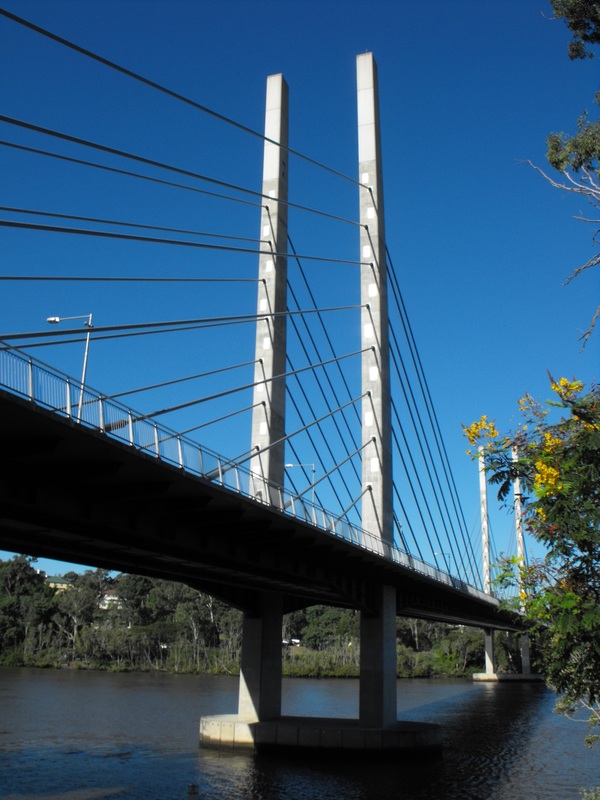 The Eleanor Schonell bridge is only for buses, pedestrians and cyclists and connects the university at St.Lucia to Dutton Park. It was originally called the Green Bridge but has been re-named after a woman who was internationally recognised for her contribution to dyslexia testing. She was also well-known for her generosity and humanity and contributed to the education of children with intellectual disabilities as well as those suffering from cerebral palsy. 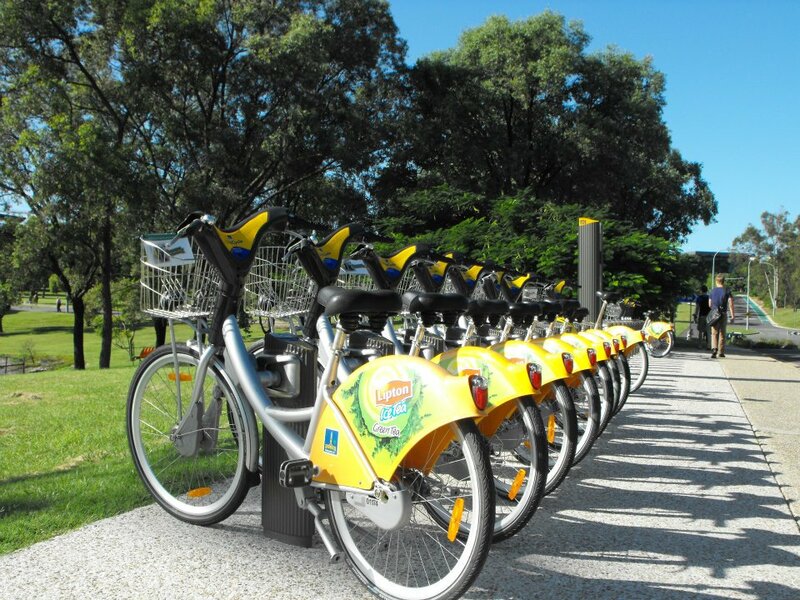 There are also racks of city cycles available for students to ride however spontaneously hiring them is not a simple process. 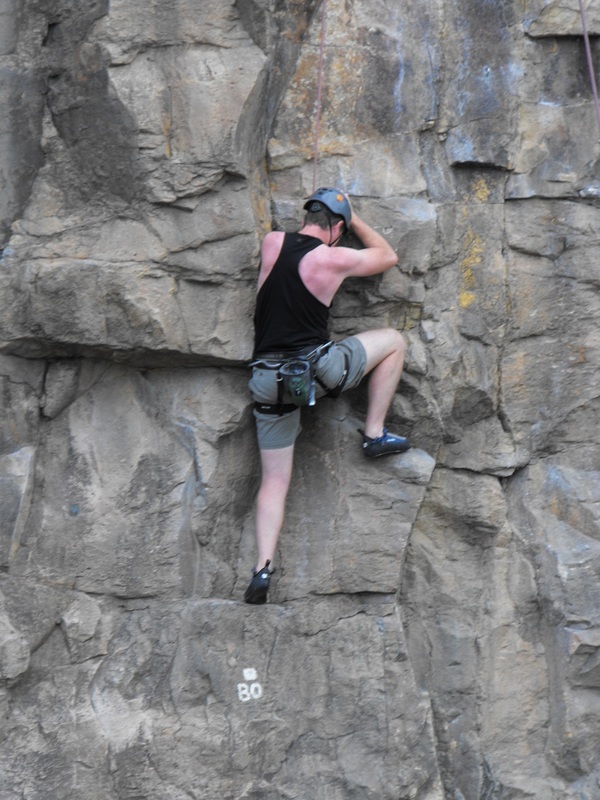 On one of my cycling jaunts along the river paths I stopped to watch rock climbers at Kangaroo Point. My mildly extreme reputation has not stretched to join them. I was happy to appreciate their far superior fitness and skills from the ground. I dragged myself out of bed early one morning to take a train and a bus to these river pathways so I could cycle at sunrise. There were no shortages of speedy riders ready to overtake me. 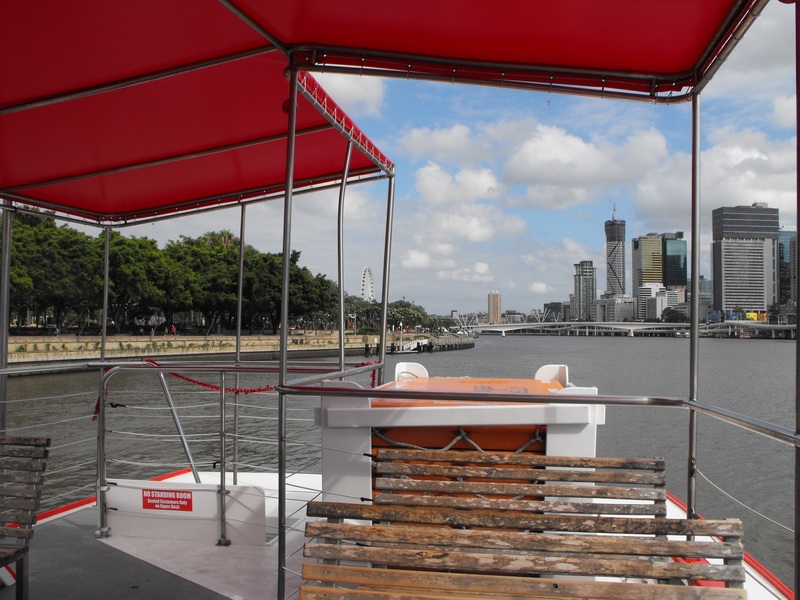 A ferry service also connects the university to other parts of Brisbane and I take advantage of this also. But I have gone off topic again, haven’t I? 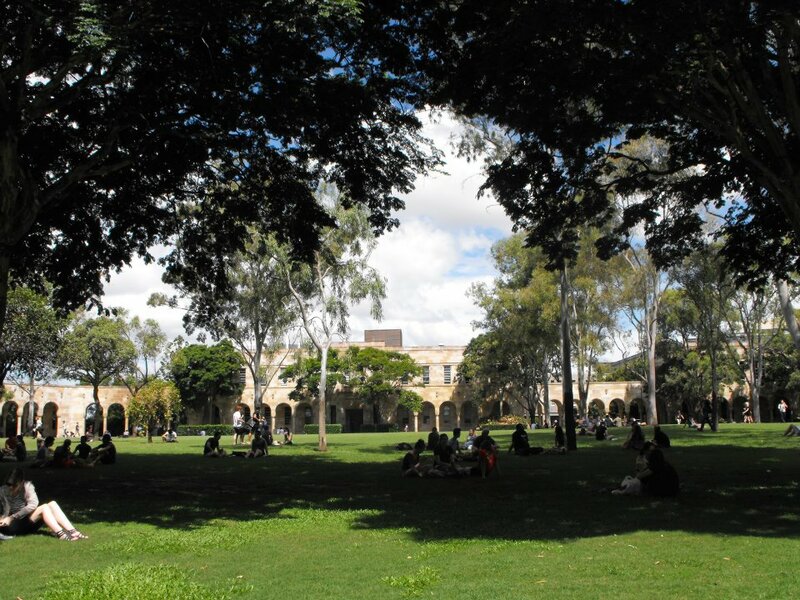 Let’s return to the University of Queensland now. As well as beautiful river paths to follow, there is architecture to admire. The great court area is surrounded by sandstone buildings. I felt very inspired as a young student when I walked through these archways. 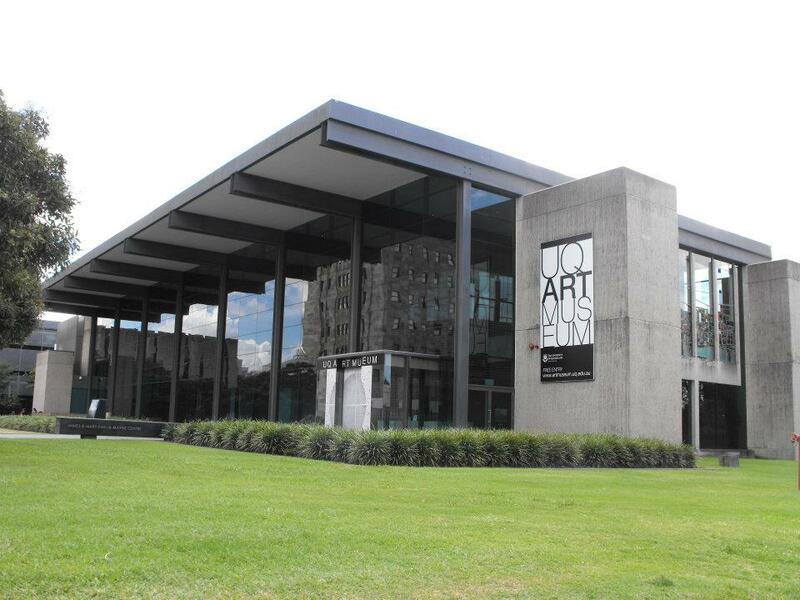 The Art Museum used to be Mayne Hall where graduations were held. Somewhere hidden inside is a massive pipe organ. 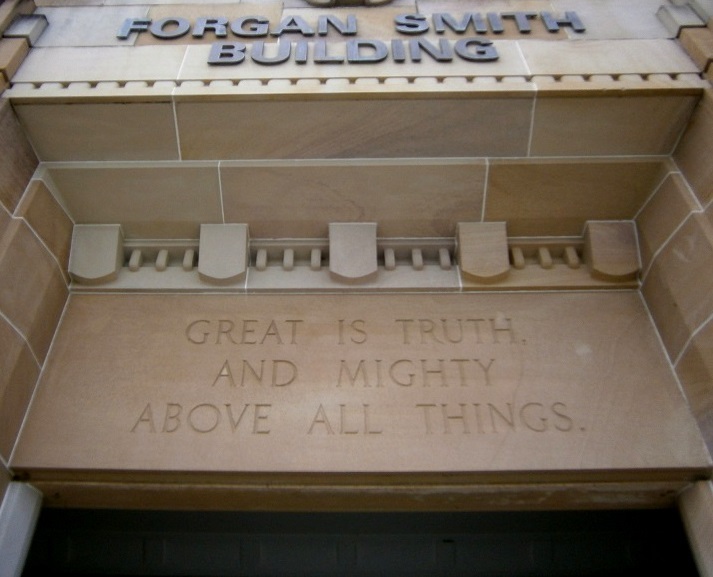 To end my little tour I’d like to leave you with the words on the Forgan Smith Building (the law faculty). 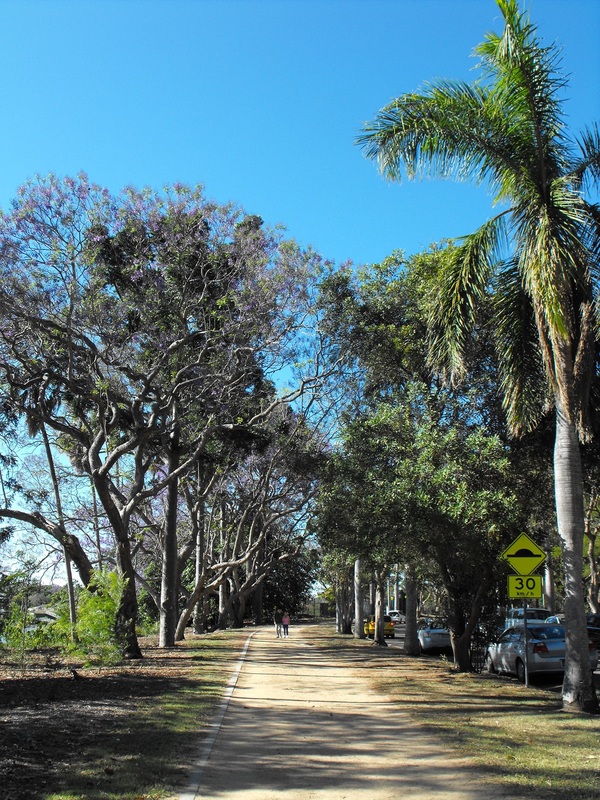 An avenue of Jacaranda trees is a lasting memory of a visit to Queensland many years ago. I can still see them in my mind’s eye and was so pleased to see them again in this interesting post. Hope the horrid food poisoning episode didn’t lay you out for too long. Hi Jane, I enjoyed your urban walk story, well done on improvising under what sounds like unpleasant circumstances. And thankyou for citing my post, it is much appreciated. As for the truth, well I like to say ‘The truth is out there somewhere’. Hi Paula, I’m glad you enjoyed my wander along the river paths and uni grounds. I find the area very relaxing and I’m also surprised by how many creatures I see about. Thank YOU for enlightening me on ibis and egrets. Yes, the truth is out there somewhere! At least your food poisoning didn’t hit when you were on the side of a mountain. 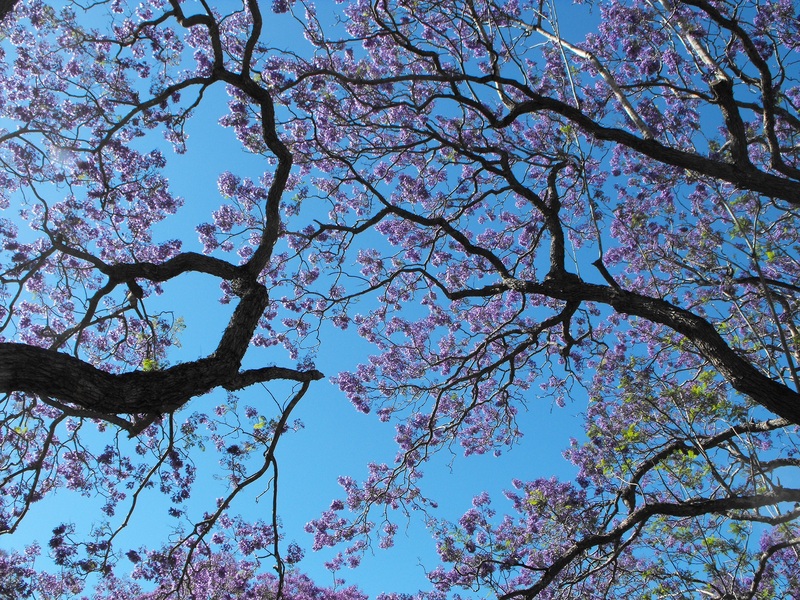 Nice bird photos and the jacarandas are gorgeous–one of my favorite trees. Yes, I was very glad I had some warning before I started the walk! Jacarandas are lovely trees. I’m always reminded of my old university exams when I see them though. How awful to have food poisoning interrupt your planned mountain climbing. That’s pretty high up there on the list of miserable experiences. I wish that I could comment as I read your post, because at my age the memory is starting to fade and I forget remarks I planned to make as I read through your post (happens elsewhere, too!) I truly did enjoy your jaunt through the University though… lovely to get to see a bit of Brisbane, It looks like a very lovely city. I did remember the nuts with the faces… very clever! Playful stuff like that is what makes a Uni-town so much fun. The food poisoning wasn’t too bad. I was probably being a little over dramatic for the sake of entertainment. It’s ok really. I got to share one of my favourite places to walk anyway. 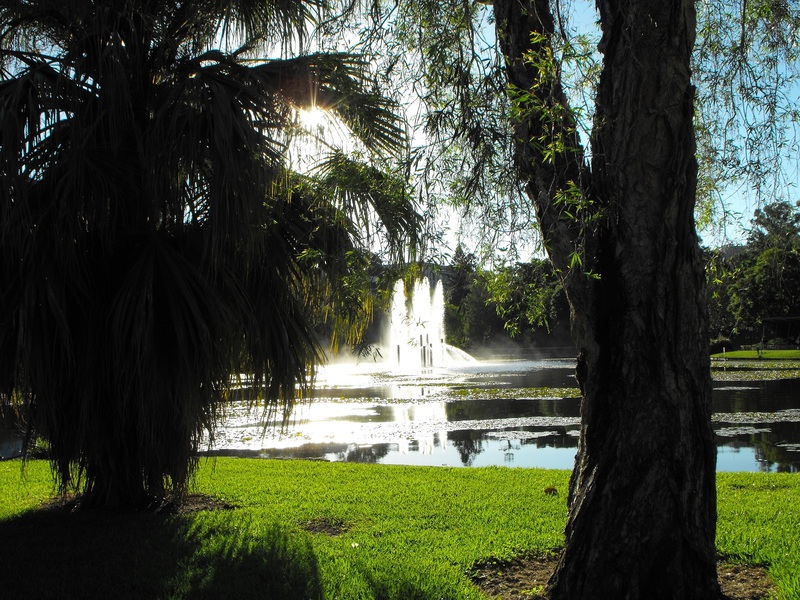 The uni grounds are lovely and yes, Brisbane is quite a lovely place to live in many ways. It certainly has many green spaces to enjoy. The faces on the seed pods did make me smile. I do the same thing with comments when I read long posts. I forget the remarks I wanted to say. 🙂 I did tend to ramble on a bit this time. It doesn’t matter so much where one goes, as it does that one gets out to enjoy nature and the other sights to be seen! It’s also good to bring back some fabulous photos as you have. How wonderful to have a walk with so many good things to look at. You made the most of it with excellent pictures for us to enjoy. You have beautiful surroundings there in which to walk/jog/bike! I love to see your photos. Years ago I began taking pictures during my outdoor excursions to bring back to my wife who isn’t able to accompany me so she could see some of the things and places that I encounter. It has occurred to me that now I take the same pleasure in seeing your pictures of your surroundings. I hope you make it to Montana too, but in the meantime you have the mountains of New Zealand’s South Island much closer to home. True, Steve! 🙂 I haven’t even been to the Blue Mountains in the southern states here in Australia. Then I have to claim one-upmanship, but just barely: during a stay in Sydney a decade ago, I managed to spend a few hours in the Blue Mountains. If I can sound Elizabethan (the first Elizabeth) and a bit peremptory, I’ll say: Get thee there. I’ve been hoping to make a trip there with my daughter as part of a spontaneous girls’ trip south. Since I’ve now been given a royal command, I have no choice but to start making some actual plans! Just think if the female/male size ratio among humans were the same as among the type of spider you showed. I wonder if anyone has already done that. If not (or not well), then go for it. So sorry about your tummy pain, but this walk is simply lovely! I find university campuses to be so enthralling. I went to one last week and enjoyed wandering the grounds. It wasn’t until late in my studies that I heard someone put relate the Jacarandas with exams (call me slow if you like!) and I haven’t heard the superstition about failing an exam because a petal fell on you! I wouldn’t have believed it anyway – I like Jacarandas too much. 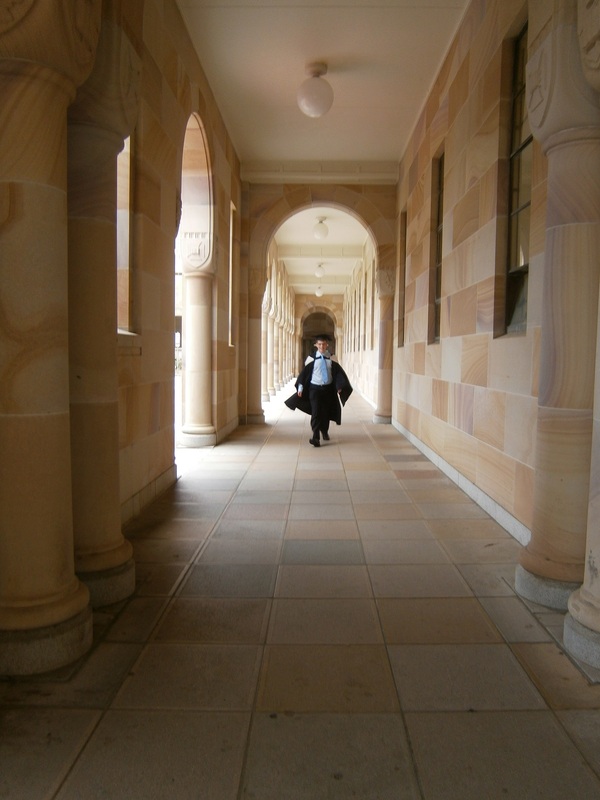 Despite being a UQ graduate myself, I haven’t spent all that much time around the St Lucia campus – my course was based at Gatton. At least when I made the hour’s drive each day it was against all the traffic! The sandstone buildings are well known for their beauty. I’m sorry your Toohey Forest walk was so rudely interrupted. I’ll look forward to that post and seeing how much has changed from what I remember of it. Don’t hold your breath hoping to see koalas though… I’m not sure any live there. I lived in St.Lucia so got to spend a great deal of time around the campus. Those were the days when accommodation was cheap. You could rent a 2 bedroom flat for $125/week. Now it’s about triple that. My brother did his environmental management degree and lived at the Gatton campus in a caravan park. It’s a lovely spot but a long drive each day. Great that it is against the peak hour traffic though! I visited him sometimes and went to a lake/waterway at a park there that had lots of birds. I remember being persuaded to take part in the wheelie bin race in the Great Court during Orientation Week. As I was the small one I had to be inside the smelly wheelie bin. The race was on TV but of course I was inside the bin so didn’t become famous! 😉 That was about the only wild thing I ever did as a student. I was very nerdy. So many of these Brisbane forest walks have pictures of koalas in the brochures but I have never seen them on my walks here! The only one I’ve seen in the wild was at a farm at Warwick. I recently read about a large population of koalas in a pocket down south (at Cape Ottaway I think??) that had stripped the trees bare. We certainly don’t have that problem where I live! 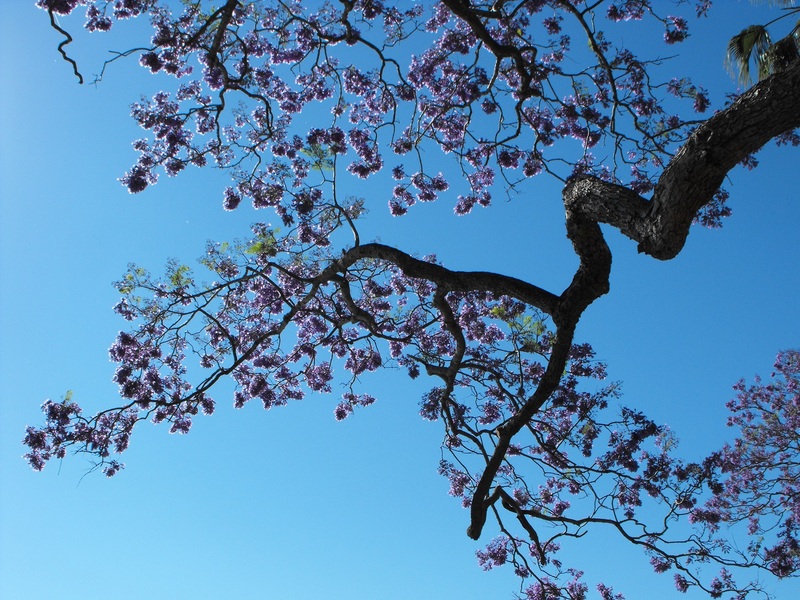 Jacarandas are beautiful trees. I love them more now that I am not a young anxious student! I’m pretty sure my parents said they saw an echidna in the forest a couple of months ago – they were as surprised to see it as I was to hear that news! Worth keeping your eyes open. I’m glad your going with your son. My sister and I never encountered anything suss (we also usually took our dog with us), but our aunt and uncle who worked at the Nathan campus of GU were always ready to tell the latest story of what had been found ‘just off the track’. And there were a couple of other incidents reported in the local paper. But again – I never saw or experienced anything myself. Thanks for the safety warning, Dayna. I’ve heard of a few incidents at Toohey Forest in relation to women joggers. I actually feel safer walking in more remote national parks than I do in local reserves in Brisbane. I always take someone with me for local walks. Being close to suburbs and the uni, there tends to be more chance for people to be lingering and waiting about for an “opportunity.” My son lives in the area so it’s really convenient for him too. Anything near the universities tends to be a little more dangerous I think. 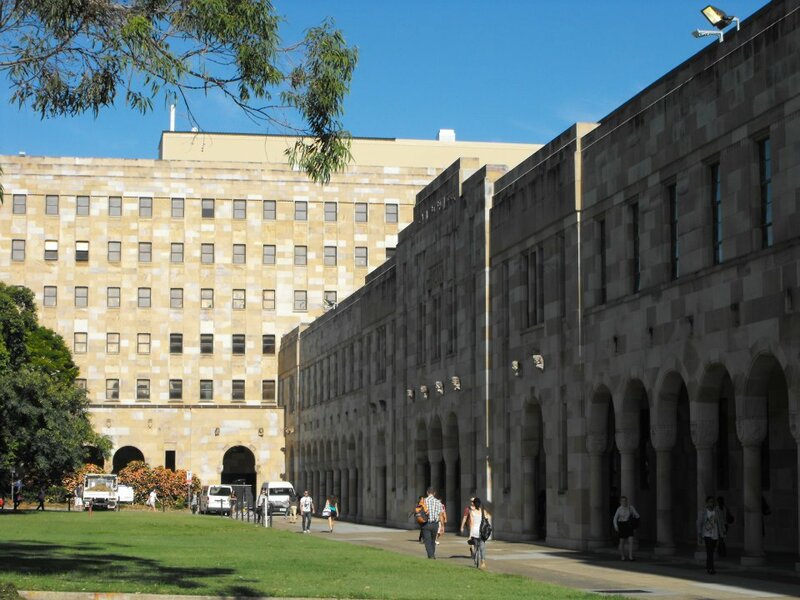 There have been problems at UQ St. Lucia with stalkers in the last year. It has been a topsy turvy few weeks hasn’t it? We need to organise a walk soon I think! Having lived in Brisbane (Indooroopilly and Yeerongpilly) for 5 years myself I enjoyed this post. 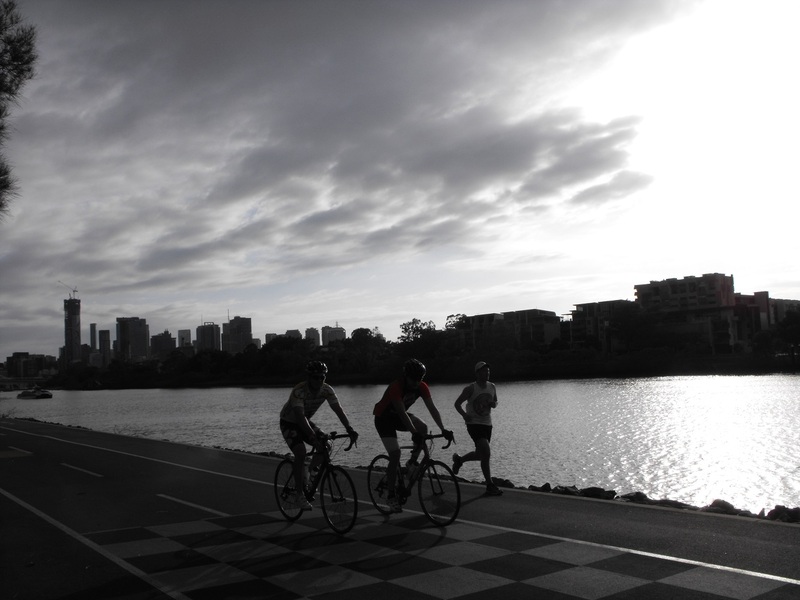 I had my usual daily walking circuits which usually involved walking along the Brisbane River at some point. I loved it when the jacarandas and poincianas would bloom, so very beautiful. Hope you have a lovely long weekend over the Easter Break, although it looks like we are in for a wet one! Yes, it has been rather tumultuous in many ways. I am looking forward to some quiet, uneventful time for a while. I hope you are all better now from your illness? Yes, a walk down your way would be great. I will send you a message when I can work out some times I know I have available. Things have been a bit unpredictable here lately. It does seem like we are in for more wet weather. I may be visiting a relative out north-west at Easter but that will depend on a few things -weather included. The Jacarandas are indeed lovely and thanks for reminding me of the poincianas too! We had them in our front yard at Sherwood. I lived at St.Lucia, Sherwood and Tennyson during my student days. Wow! There is so much to see where you are at. Sure wish there was more in my area. 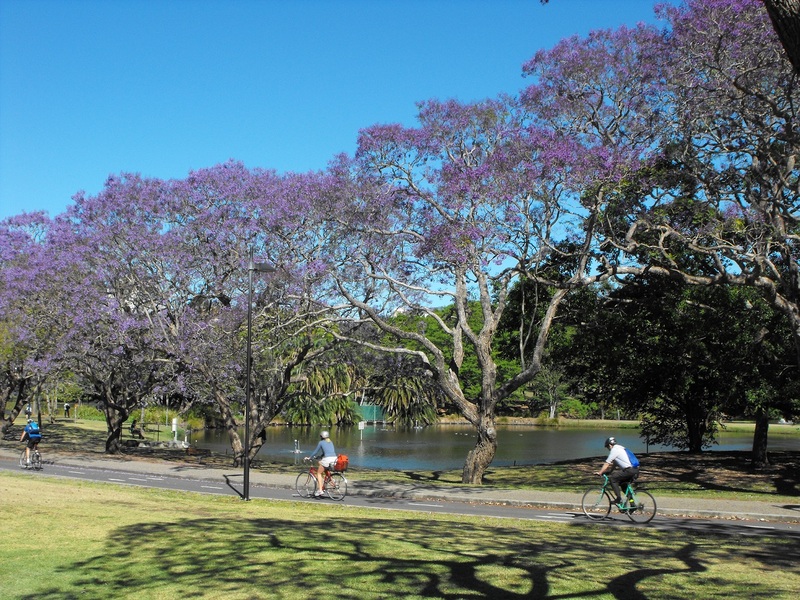 Gorgeous pictures Jane – bringing back happy memories of walking around u of q campus as a student (at a rival Brisbane university!) myself. Oddly my other half had food poisoning the day we walked up Mt Maroon many years ago… Perhaps it’s something about the place?? Hi Jane, I can’t imagine any ginger nut biscuit caused food poisoning so I think you are quite safe indulging in your treats in future. I loved the photos of the spiders. Spiders are so fascinating. I recently rescued a large beetle which became tangled in a web recently. I was impressed the web was strong enough to hold the beetle fast.